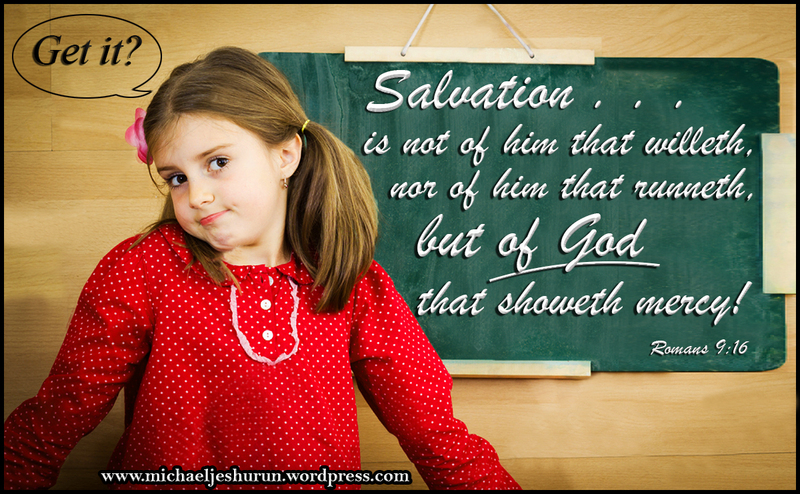 ‘Free-will’ Salvation – a mockery of God! Ultimately, Salvation according to the Arminian is NOT “of the Lord!” [Jonah 2:9] it is of “the Lord AND man!” Salvation is NOT by grace ALONE but by grace PLUS WORKS! In the final analysis man hath whereof to glory (Rom 4:2) for without HIS ‘cooperation’ Christ died in vain! “Now to him that worketh is the reward not reckoned of grace, BUT OF DEBT! I believe it was C.H. Spurgeon that once said (paraphrased) > “Yes man has a free will when it comes to his natural carnal desires, but ONLY the spirit of the living God can change, turn and take possession of his spiritual soul” Jesus said “For you have NOT CHOSEN ME, but I HAVE CHOSEN YOU” All twelve Disciples he selected, chose and called. God sorta changed Apostle Paul’s free-will, free choice, decision while on the road to Demascus and totally re-arranged Jonah’s stubborn self-will. Reblogged this on My Hope Is In Thee.